This company once engaged a cheating activity with TraderCapitals.com on Performance Test as the same account was being used by them both for different strategies. We have been with fxmac for half a year or so. Felt very safe and very professional. I would recommend them! I have used its service for over 1 year now in system1. It has been positive so far though yet to recoup loss in Feb2016. I join this program for about 2months, with about $5000 capital. and the result was as advertised. And their customer service was good, they reply my email within a day :) thumb up for them. i will increase my fund with them in the future. 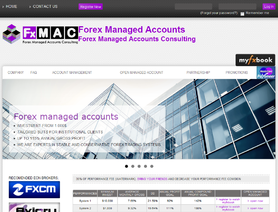 Fxmac is not fake website. We have several LONG-TERM-CONSERVATIVE systems. Any one can go the website and whach real long-term-accounts (for more than 3 years, some of them) and verified by Myfxbook and Fxstat. Nobody has lose a simple month with any of our conservative systems. They are public and any one can check. We don't know why we have enemies that we don't know and why they related to any lose. We ask this person that stop creating bad image about LONG-TERM-CONSERVATIVE systems that we have publically in our website and they cannot be faked. One important thing to know is that no one know and will don't know the name of any of our traders. So, we guess this incredible criticism has being done by our company competition. And it has not good a real basis. Our wbsite shows publically the systems with no a single lost.